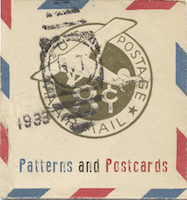 Patterns and Postcards is an inter-blog swapfest. Part I lists all of the vintage patterns I have up for swap. This post lists the (new and improved) guidelines along with a list of participating members. Which, I guess, makes this the main course. Most of my magazines (read the Patrones) were hard-won in epic, deranged, exceptionally non-Romulan, evilbay battles. Which means if you want to swap for them you’re going to have to get out the big guns. Patterns magazines and books – Knipmode Magazines (May 2006, August 2007, October 2007, February 2008 and August 2010), older Burda, Patrones and La Mia Boutique magazines, Japanese sewing books. Envelope patterns – Vogue Designer patterns and patterns for knit fabric garments (especially Jalie/ Hot Patterns) sizes 4-10 depending on the manufacturer. So go on, make me an offer (once you’ve read this). Click on the image to go to a ThingLink page where every magazine is linked (by little coloured circles) to pattern summary shots and/ or reviews and/ or full browse-throughs.